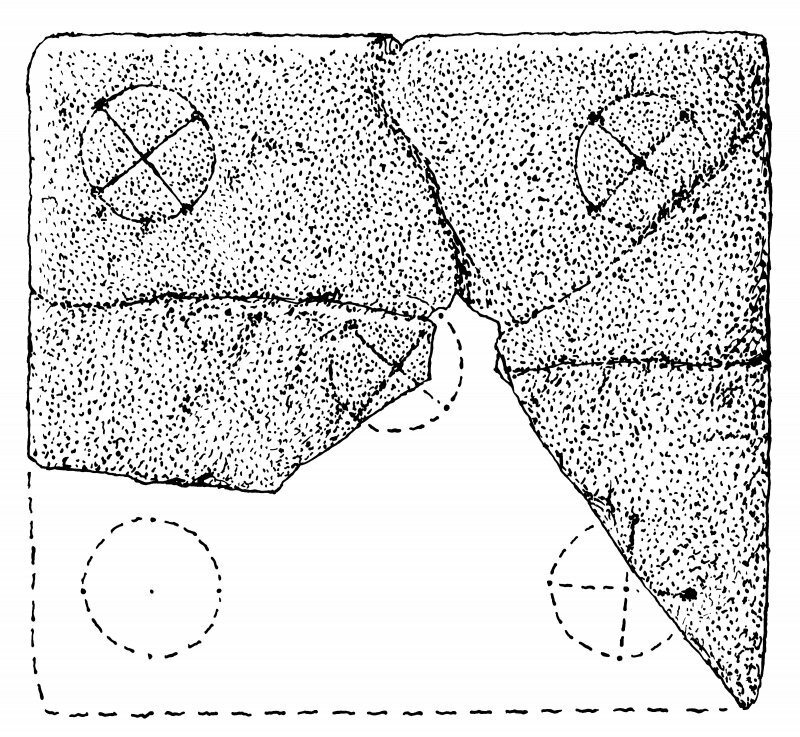 Measured drawing of portable cross-slab from Papa Stronsay. Measured drawing of cross-slab from Papa Stronsay. Evidence for discovery: found buried ‘three or four feet deep’ in a graveyard close to St Nicholas’ Chapel around 1850 and taken to the Kirkwall town house of the Heddle family of Melsetter. P A Jastresbski drew the stone soon afterwards for John Stuart’s first volume of Sculptured Stones of Scotland (1856), and around the same time Sir Henry Dryden made a paper squeeze of it, which was used by Allen for the drawing published in ECMS in 1903 (mistakenly taking the edge of the squeeze to represent the edge of the slab). By 1888 the stone was lost. This was a small and slender rectangular slab, easily portable. On the upper part of one broad face was incised an almost equal-armed cross with double-scroll terminals to the upper arms and an oblong terminal, or base, to the lower arm. At a slant above the cross is a Latin inscription incised with forked serifs, which reads ‘dnedi’, an abbreviated version Domine Dei, ‘O Lord God’. References: Stuart 1856, 14, pl 42; Orkney Archives D29/8/8, 4 April 1888; ECMS pt 3, 24-5; Fisher 2002, 47, fig 3.5; Lowe 2002, 86; Scott & Ritchie 2014, 189, no 29. Present location: Headland Archaeology, Edinburgh. Evidence for discovery: found re-used in the floor of the nave of the twelfth-century St Nicholas’ Chapel during excavations in 1998. Present condition: five conjoining fragments survive, representing some two thirds of the slab. The carved surface is damaged and worn. These fragments come from a portable altar slab with chamfered edges. The upper face is firmly incised, using compasses, with five encircled crosses, of which two are incomplete and a sixth is missing. There would originally have been a central cross and a cross in each corner. References: Lowe 2002, 88-90; Scott & Ritchie 2014, no 31. For font at HY 6662 2927, see HY62NE 41. The site of a chapel almost entire about 1783, but demolished shortly before 1795 to provide material for a barn. Anderson states that 'the dimensions within walls 15 feet by 12; the quire 7 feet by 9; the quire is covered with a complete stone arch, but the chapel hath been demolished' which implies that part of the chapel was left. A small rectangular slab 11" by 3" bearing an ornamental cross and a contracted miniscule inscription which Radford interprets as standing for D(OMI)NE D(E)I (O' Lord God) was dug up near the chapel. Radford dates the slab to the 7th or 8thc's. It was in the possession of Mr Heddle of Melsetter, (ND 26 89) in 1903, but is now lost. Statistical Account (OSA) 1795; J R Allen and J Anderson 1903; RCAHMS 1946, visited 1928; C A R Radford 1962. There is no trace of structure at the published site but c40.0m to the SW at HY 6695 2918 are the vague turf covered footings 0.2m high of a building oriented E - W which are almost certainly the remains of the chapel, consisting of nave and chancel. Between wall centres the nave measures c5.5m E-W by c5.0m transversely and the chancel c4.0m E-W by c3.0m transversely. No wall faces are evident and the wall thickness cannot be ascertained. Two upright slabs 1.7m apart and each 1.1m in length appear to form part of the E wall of the nave. The name St Nicholas's Chapel is known locally. To the S of the chapel traces of dry stone walling visible in the eroded shoreline may possibly be part of the graveyard wall. Visited by OS (AA) 16 July 1970.
inscribed D(OMI)NE D(E)I was lost before the end of the last century. J Rhys 1892; J Rhys 1898; RCAHMS 1984, visited July 1979. HY 6695 2918 Early Christian chapel and pilgrimage centre. Topographical survey recorded the remains of the chapel and part of a possible stone pathway. A continuous, 39m long section recorded archaeological remains visible in the coastal exposure. Several short stretches of walling, possibly part of an enclosure wall, and portions of paved surfaces were seen. HY 6695 2918 Geophysical and topographical survey and excavation were undertaken jointly by Birmingham University Field Archaeology Unit and Headland Archaeology at the site of St Nicholas Chapel (NMRS HY62NE 14) in advance of coastal erosion. The work was prompted by the earlier survey by EASE (Wilson and Moore 1996) which had recorded the exposed cliff section and identified a possible stone pathway and elements of an enclosure around the chapel. Recorded in the Old Statistical Account as having been partially demolished in the late 18th century, the chapel was found to comprise a bicameral structure of nave and chancel type. The chancel is said to have been 'covered with a complete stone arch', presumably a barrel vault of the type preserved at Crosskirk, Tuquoy, Westray. The building is assumed to date to the 12th century. The nave is 5.3 x 3.95m, and the chancel roughly 2.7m long and 2.5m wide within walls 0.6?0.7m thick and standing up to 0.3m high, over a plinth. A blocked entrance, 0.7m wide, with straight jambs was located in the centre of the W wall. The interior wall faces of the building are plastered. The primary floor of the building appears to have been almost wholly robbed. A mortared altar, 1.18 x 0.7m and standing 0.3m high, lay against the E wall of the chancel. Two smaller subsidiary altars, formed of drystone masonry with a large edge-set frontal stone, were located in the NE and SE corners of the nave. The presence of multiple altars may imply a monastic association. The building was apparently located near the centre of a small, possibly polygonal enclosure, the drystone walls of which were located. A possible long cist burial, pre-dating the enclosure wall, was identified in section immediately outwith the enclosure. The remains of the collapsed W gable and door lintel were clearly evident outside the building. Other late deposits and features included: a crude wall, aligned N-S, which was butted against the exterior NE corner of the chancel; late flooring or resurfacing of the nave interior; and a field dyke. The latter, previously identified as part of a possible stone pathway which approached the site from the SW, was found to post-date the collapse and robbing of the building. Pre-chapel structures and features were also identified on the site and may provide a context for the structures exposed in the adjacent cliff section. Principal amongst these was a cellular building which was exposed immediately to the N and below the chapel. Areas of paving were also revealed to the W of the chapel, extending beneath it. Further pre-chapel features, including a series of possible drain capstones, were also evident to the NE of the chapel. Artefacts were generally absent, but the pre-chapel structures and features are provisionally interpreted as Pictish. The results of the geophysical survey and trial trenching suggest that the remains exposed in the cliff section represent an outer element of a settlement which has otherwise been lost to the sea. Sponsors:Historic Scotland, British Academy, University of Birmingham. S Buteux, J Hunter and C Lowe 1998. HY 6695 2918 Excavation continued at and adjacent to the site of St Nicholas Chapel (NMRS HY62NE 14), in advance of coastal erosion (Buteux, Hunter and Lowe 1998). The project is being undertaken jointly by Birmingham University Field Archaeology Unit and Headland Archaeology. Work continued on Trench A, the chapel and its immediate environs, and Trench B, immediately adjacent to the SW. Two new areas were opened: one (Trench D) to the NW, at the projected corner of the chapel enclosure; the other (Trench E), roughly 40m to the SW, to investigate the nature and extent of the masonry in the eroding cliff section. Excavation in the nave revealed a hollowed sandstone basin, possibly a water stoup or piscina, among the make-up deposits for the secondary floor. Below the make-up was an earlier floor level from which were recovered three conjoining fragments of a cross-incised stone. A fourth conjoining fragment was recovered from an unstratified context. The four fragments go together to form what is clearly an altar slab, 40mm thick, 280mm long and probably 260mm wide. Formed on yellow sandstone with a chamfered edge, the surface of the slab displays three incised saltire crosses and one Latin cross: the saltire crosses are set within compass-drawn circles 58mm in diameter. The terminals of all four crosses are punctuated by drilled holes, 2mm deep. The slab is possibly 11th or 12th century in date. A small fragment of porfido verde antico was recovered from beneath the N wall of the nave, from amongst deposits filling the earlier cellular building to the N.
The present chapel is clearly a multi-phase structure. Investigation of the masonry joints between the nave and chancel show that the latter was appended onto an earlier, single-cell building. An intermediate phase, represented by an originally wider chancel arch, may also be indicated. Current evidence would suggest that the two side altars form part of the chapel in its final phase. Graves were encountered within and outwith the chapel: one, a long cist, its contents poorly preserved, partially underlay the SE corner of the chancel; another, a dug grave containing the well-preserved remains of a child or young adult, was found immediately in front of the chancel step, between the two side altars. Redeposited and disturbed burials were also found inside the chapel and outside it, to the S.
The drystone walls of an enclosure were traced to the N, W and NW of the chapel: the line of an earlier enclosure, possibly associated with the pre-chapel settlement, was also traced inside the later enclosure wall to the N and outside it to the W. The S return of both enclosures has been removed by erosion of the cliff face. The small stone box, previously seen in section, was found to underlie a small cairn of stones or tumble from the adjacent wall, against which it was inserted. The feature, constructed of stone roofing tiles, was empty. Pre-chapel structures and features were also investigated. In addition to the previously identified cellular building, from which the green porphyry was recovered, further features were found to the NE of the chapel. These comprised a complex array of drystone walls and flagged surfaces, one of the latter incorporating a stone-lined tank. Overlying these features, and only partially excavated, was a midden, rich in shells. Coarse pottery of Iron Age type and two probable line-sinkers were recovered from the midden: a bone comb fragment was recovered from a related deposit nearby. Trench E, on the cliff edge to the SW of the chapel, was opened to investigate the character and extent of the eroding remains. This revealed an area of cobbling, possibly paved in places, and delimited on its seaward side by a drystone wall. Against the landward side of the wall were the remains of what may be a small stone platform, very tentatively interpreted as a station for a wayside altar. Further details and photographs are available at www.stronsay. co.uk/archaeology. A full report has been lodged with the NMRS. Sponsors: Historic Scotland, Arts & Humanities Research Board, University of Birmingham, Hunter Archaeological Trust, Orkney Islands Council, Russell Trust, Society of Antiquaries of Scotland. S Buteux, J Hunter and C Lowe 1999. HY 6695 2918 The aims of the fieldwork on the above site laid out in the report for the 1999 season were to investigate the general character of the character of the pre- chapel settlement, to fully understand the structural sequence of the church and to establish a full plan of the enclosure around the church. It states theses aims have been largely achieved and the work has confirmed the high potential of the site. Priorities for the next stage include investigation of the pre-chapel domestic structures threatened by coastal erosion; to extend to the coast line to investigate the sequence of the burials and possible pre-chapel structures; Investigate the construction and use sequence of the chapel and to clarify the form and relationship of the two phases of the enclosure walling. NMRS MS/899/151 (Headland Archaeology Ltd & The University of Birmingham. 1999). A third season of excavation was undertaken at and around the site of St Nicholas' Chapel in advance of coastal erosion. This season the main excavation area (Trench A) was expanded on all four sides, extending to the coastal edge on the S and E sides, and incorporating Trench B to the W. The excavations have shown that the chapel originated as a single-celled building, probably of 11th-century date, with the chancel added in the 12th century. Burials were discovered both within and without the chapel. Underlying the 11th-century nave are the remains of a cellular structure, accessed by a flagged pathway leading from the coast, from which a fragment of green porphyry was recovered. Further pre-chapel structures lie to the E and SW of the chapel, possibly representing part of an early monastic settlement. Adjacent to the cliff edge on the S of the chapel was a grave of proable pre-Christian tradition. Two phases of enclosure walling have been revlealed, one apparently contemporary with the medieval chapel and the other apparently contemporary with some of the earlier structures. NMRS MS/1039/53 (Headland Archaeology Ltd & The University of Birmingham. 2000). HY 6695 2918 A third season of excavation was undertaken at and adjacent to the site of St Nicholas Chapel, in advance of coastal erosion (DES 1999, 68-9). The project is being undertaken jointly by Birmingham University Field Archaeology Unit and Headland Archaeology. Extension of the excavated area to the cliff edge revealed a series of early surfaces and the truncated remains of an early, possibly pre-Christian grave containing two slightly flexed inhumations. Work inside the chapel, below the chancel, revealed the W end of a large sub-rectangular building; at the W end of the nave, underlying the wall, was a continuation of the early pathway seen outside the chapel. A series of slots, parallel and perpendicular to the extant building, were also identified inside the nave. Work on the enclosure walls has confirmed their relationship, the later enclosure lying to the N and E of its predecessor. However, no clear evidence of an entrance into the later enclosure could be discerned. Work on the features to the NE of the chapel also continued. The principal results of the season can be considered under four main headings. The coastal path, previously only seen in Trench E to the SW and in the exposed cliff section, was found to turn N, crossing the W side of the main excavation area. The path was formed of large flat slabs, their sides lined with narrow edge-set stones, and was found to continue underneath the W wall of the extant nave. Although disturbed by later building works, it is clear that the path led up to the corbelled cellular building, partially excavated in 1998/99. Further work this year, in the centre of the floor in line with the pathway, has identified a rectangular stone setting containing the stump of an upright stone. A fragment of green porphyry was recovered from the floor of the building in 1999. These factors, together, strongly suggest that the building was of some importance, possibly of ritual significance. It clearly pre-dates the nave, the construction of which possibly represents a feature of the 11th century. It may represent an element of the pre-Norse monastic settlement on the site. Despite extensive excavation in and around the chapel, extremely few graves have thus far been identified. Redeposited remains have also been rare. This is contrary to what might have been expected, given the circumstances of the discovery of the now lost DNE DI cross-slab when large quantities of human skeletal material were exposed. The cemetery, and with it the find site, may have lain to the S or E of the chapel, in those sectors most susceptible to erosion. However, the rare occurrence of graves or human bones in these areas, as excavated, might suggest that the cemetery lay elsewhere. The recorded depth of burial (3' or 4') of the lost cross-slab and its distance from the chapel (20yd) might imply a location in the deeper soils to the N of the excavated site. An unusual, and stratigraphically early, grave, aligned NE-SW, was located near the cliff edge, to the S of the chapel. The grave contained the much truncated remains of two young adults, lying on their right sides, facing S, with their legs slightly flexed. A second, stratigraphically late, grave lay to the E of the chancel. The fragmentary remains of a large sub-rectangular building, aligned NE-SW, were located under and to the E of the chapel. The building is stratigraphically at the same level as the corbelled cell and pathway to the W, and could represent contemporary elements of an early monastic settlement. The putative W wall of the building lay at an angle below the floor of the chancel. Internally, the building was roughly 7.5m long, at least 2m wide on the NE and possibly wider on the SW. The stone-lined tank, excavated in 1999, lay along the centre line of the building just in front of the narrower E end. The long walls of the building appear largely to have been robbed; their line may be indicated on the N by the extent of paving and on the S by a series of edge-set stone features, possibly set within the wall line of the building. The function of the building is not clear. The stratigraphic relationship of the two enclosures is well-established, with, to the N of the chapel, wall 1066 superseding the earlier wall 1126. There are indications, however, not yet fully resolved, that the earlier wall line (1126) represents a composite, multi-phase structure. Its relationship to the corbelled cellular building and to the large sub-rectangular building to the E is not clear. Further details and photographs are available at www.stronsay.co.uk/archaeology. A full report has been lodged with the NMRS. C E Lowe, S Buteux and J Hunter 2000. HY 6695 2918 A fourth and final season of excavation was undertaken at and adjacent to the site of St Nicholas Chapel (NMRS HY62NE 14), in advance of coastal erosion (DES 2000, 67-68). Work was concentrated on the fragmentary remains of a large sub-rectangular building, aligned NE-SW, which lies under and to the E of the chapel. Roughly 7.5 x 2m internally, the interior of the building was dominated by a large central hearth, rich in charcoal and carbonised grain. Fragments of Iron Age pottery were also recovered. Trial trenches were also excavated to the N and W of the chapel. Additional elements of the previously recognised enclosures were traced but there was no evidence for a cemetery in the deeper soils outwith the enclosed ground. Further details and photographs of the project are available at www.stronsay.co.uk/archaeology. C E Lowe, S Buteux and J Hunter 2001. Illustration of a cross-slab. [R2], Hobner. No further information on site. Cross-slab reported lost. Vague turf-covered footings 0.2m high orientated E-W. Between wall centres, nave 5.5m E-W x 5m, chancel 4m E-W x 3m. in eroded shoreline, possibly part of graveyard wall.